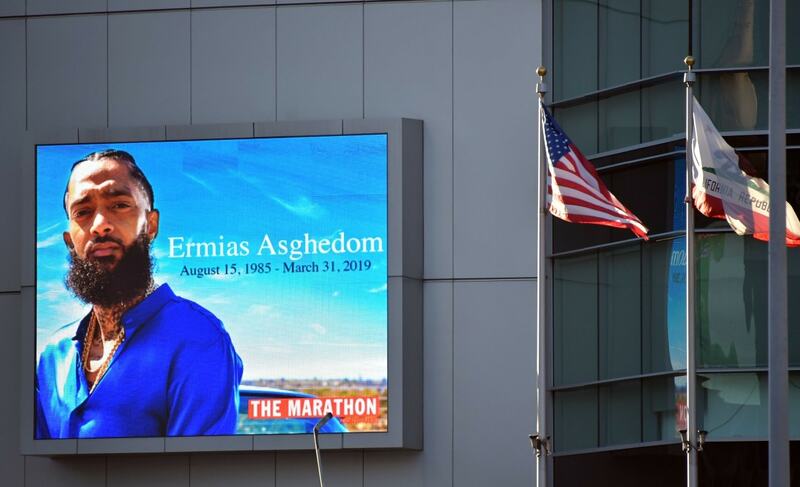 Thursday, friends, family and tens of thousands of fans who never knew him, all showed up to the Los Angeles’ Staples Center to say goodbye to Nipsey Hussle. When my colleagues at theGrio and I showed up just after 7 a.m there was already a massive crowd forming outside. From the buttons, t-shirts and other merchandise being sold outside, to an amazing artist painting a fresh portrait of Nipsey while news teams plucked people out of the line for “man on the street” interviews — it quickly became clear just how much L.A. really cared about this brother. So I was feeling hopeful and inspired when I finally made it to my seat two hours later. However, by the time we all walked out, that hope had turned into a heavy introspection that followed us all the way to our late lunch meeting, where we barely picked at our food and instead chewed over what we’d just witnessed. Usually when I write this column I have a pretty clear opinion about the subject at hand and do my best to thoughtfully unpack it. But on this occasion I think I’m still processing even as I type this. It’s hard to encapsulate the complex (and at times conflicting) emotions we felt as we sat just to the left of the stage area on Thursday. At first there was the panic that swept over me on not just one — but four — occasions where fights almost broke out inside. Grown men in varying shades of blue (or a peaceful gang neutral white) grappling with deep feelings of loss, but also armed with very few tools to cope with that grief, were essentially being asked to sit amongst some of their former enemies, and mourn one of the only people they all loved in common. That in itself is an emotional powder keg of grief just waiting to go off. But in each incident cooler heads (eventually) prevailed as spectators and security alike all jumped up to say, “Not today. This is about Nipsey. Nipsey wouldn’t want this!” It was as if the mere mention of this man’s name had the power to serve as a soothing salve on an otherwise raw and freshly cut wound. Then there were the celebrities and their security guards, tense and alert, visibly scoping the scene for exits. There was the grieving family members and close friends sitting in the front orchestra section, doing their best to hold it together, all too aware that the whole world was watching. And let’s not forget the droves of concerned Black and Brown women squinting at that same front row, trying to catch a glimpse of Lauren, to send her love, and support, while awash in waves of empathy, for what she must be going through. The energy in the Staples Center was equal parts electric and somber, which made me a bit apprehensive as the start time for the service came and went with no sign of actually beginning. Yet when the service eventually did get going, and that deejay blasted Nipsey’s music into the crowd, the thunder of applause and rejoice that suddenly took over was so pure and unified as they all screamed “Nipsey! Nipsey” at the top of their lungs, many of us got hit between the eyes with emotion and immediately started crying. It was easily one of the most beautiful things I have ever witnessed in person. And just like that any fears about violence slipped away. I was no longer in a room full of gangbangers and celebrities, but instead surrounded by people who stood as a testament of just how much one man could inspire millions. When later asked how it felt to be there in person, I would find myself responding, “It’s complicated,” a phrase usually reserved for unstable relationships. But perhaps it makes sense that the public memorial was as complicated as the man we all showed up to celebrate. You can’t honestly examine Nipsey’s legacy without wondering what does it must feel like to stand for peace while still having an unshakable loyalty to a world saturated in violence. And how do you reconcile making it out of the hood, but still being tethered to it till your dying breath? Nipsey Hussle lived in the ego-centric spotlight of celebrity but also possessed an altruistic humility that uplifted a whole community. He was a masterpiece of contradictions and an impactful visionary. But despite the fact that he was 33 when he died, I get nervous when people start calling him Jesus. Don’t get me wrong, I can see why it’s enticing to make him into a martyr. The world we live in is so wicked these days we’re all a bit thirsty for a savior story right now. But to deify Nipsey in the afterlife feels shortsighted. Because while inspiring, propelling him to a godlike status would also allow us (mere mortals) to detach ourselves from thinking we could accomplish all that he did. However, if we admit Nipsey was a flesh and blood man, who had a tenacity that allowed him to put one foot in front of the other until he got where he was going, then suddenly we are forced to ask ourselves why we aren’t doing the same. I much prefer that stance as it’s the only one that feels balanced. And to all the people applauding Lauren and Nipsey’s mother for their strength: I would like to very respectfully ask you to chill out on all the “that’s how a real woman handles grief,” and, “wow she’s so strong, we all need to be that strong,” messages. Because while I understand your hearts are in the right place, we sincerely need to stop applauding Black women for how much pain they can endure. I can personally attest that grief is a messy business and it comes in waves. There is no one exalted way that a “real” woman should be expected to receive it. And just because those two ladies are standing up at podiums speaking on “perfect peace” and yelling out a battle cry about “the marathon continues!” this week, doesn’t mean they won’t each fall to pieces and find theirselves sobbing on the kitchen floor a month from now. This rush to make Nipsey a martyr and his family the poster children for stoicism serves no one. We need to make room for the messier parts of this conversation. We need to make room for his loved ones to know they can unravel and get it “wrong” without us judging their process. We need to unpack the themes that Nipsey’s life and death so clearly highlight such as, gun violence, economic empowerment, and the increasingly tricky ways in which we demonize and yet at times also glorify gang culture. So in a nutshell, was I inspired during Nipsey’s public funeral? Absolutely. We cried on several occasions, overwhelmed by the magnitude of the spirit we just lost. But at times I also slipped into a pensive concern about what happens next. And am still wondering if we’re all really gonna go beyond using this man as a mythical symbol and instead treat his accomplishments as a blueprint of where we go next.